Jonathan Chovancek of Café Medina in Vancouver, British Columbia, Canada. Photo credit: Issha Marie. I love the variety of ethnic cuisine in Vancouver. It’s some of the most varied and exciting of any in Canada. Everything neighborhood holds a cacophony of flavor discoveries from around the world, but specifically South China, Southeast Asia, Northern China and Vietnam. I love the secret hole-in-the-wall joints run by families cooking delicious and authentic food. 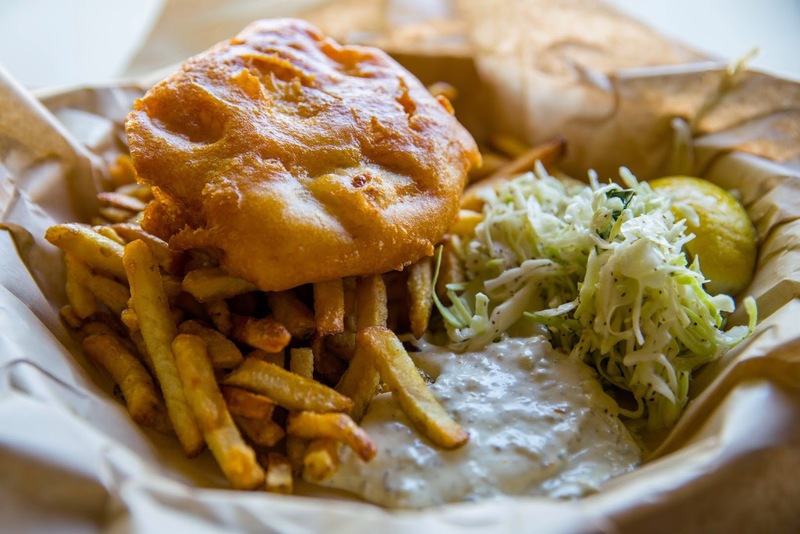 What are the top dishes that every visitor to Vancouver must try? Oysters at Boulevard Kitchen & Oyster Bar with a side of their fish-sauce caramel chicken wings and a Guinness. Korean tacos at Damso Modern Korean Cuisine. They are light but feature high-impact flavor and are available all the time. The Dirty Burger at Upstairs at Campagnolo, loaded with crispy chicken skin with an Imperial Sazerac on the side. The mussel risotto Milanese and roasted fennel salad at Ask for Luigi. The halibut with organic greens in lemon vinaigrette at Yew Restaurant + Bar. It’s simple, yet so delicious for a light lunch. Fish and chips from The Fish Counter. Photo credit: Stephen Tang. The gluten-free fish and chips with sriracha at The Fish Counter. I like the lingcod, but for a real treat, the sturgeon is worth the extra cash. The Fish Counter is truly unique and a new West Coast treasure featuring some of the freshest, ethically caught fish in the city. The bamboo charcoal ramen with organic chicken broth and kimchi at Motomachi Shokudo. Simply put, this is the BEST ramen in Canada. My perfect dining day would start with a trip to Granville Island Public Market with my sweetie for charcuterie at Oyama Sausage Co. and Benton Brothers Fine Cheese. For dinner, we’d head to Zakkushi on Denman and order the Mé Maki (garlic stubs wrapped with pork), Uzura Maki (quail eggs wrapped with pork) and Yakioni (grilled rice balls with butter soy sauce). To end the night, we’d enjoy a cheeky gin tasting at The Liberty Distillery before picking up a bottle of Joie ‘Noble Blend’ to drink on Sunset Beach as the sun sets. What’s your favorite neighborhood to eat out at and why? It’s impossible to pick just one, so I’ll point out three: Vancouver’s West End for Korean and Japanese bistro; the Downtown/Library District for high-end, destination dining and drinking; and Sunset Beach where you can grab a picnic feast and wine to-go from Granville Island and enjoy one of the most beautiful vistas on the planet as the sun sets. Café Medina’s brunch is a favorite mentioned by the majority of chefs on Eats Abroad. But what brunches in the city have impressed you? I love going to Fisherman’s Terrace in Richmond for weekend afternoon dim sum. Their whole black pepper fried Dungeness crab dish with crunchy sauce will change your life forever. The Red Wagon Café is also a regular go-to for their pulled pork pancakes with poached eggs and bourbon maple syrup – it’s sweet, spicy and perfect. What is your personal favorite dish at Café Medina? The Harissa Pain Plat “burger” because it sums up the sort of cuisine and ambiance we strive for – sustenance, big flavor, texture and originality. Harissa “Burger” from Café Medina. Photo credit: Issha Marie. What cuisines do you most enjoy eating or cooking? I enjoy everything, but for Thai food, I always think Maenam, where I can enjoy the four-course menu paired with wines and cocktails and really dig into some of the fresh seafood that owner and chef Angus An keeps in his restaurant’s fish tank. Is there anything you absolutely hate or refuse to eat? I really don’t like gooseneck barnacles. Where are your favorite places to grab a drink? The Keefer Bar, UVA Wine & Cocktail Bar, West Restaurant, Alibi Room, and The Lobby Lounge and Terrace. Gringo is one of a kind and a must see! What dish is your guilty pleasure, and where do you get it in Vancouver? That would be walking home eating a large-size poutine from Fritz European Fry House after enjoying a good night out on the town. Their gravy is super peppery and the cheese curds melt just the right amount. When you get to the bottom of the box, everything has formed into the most satisfying texture of crunch and sog and squeak and melty business! Are there any foods native to Vancouver or B.C. that you particularly like and cannot be found anywhere else? If you can find it in the spring, herring roe on kelp is amazing fried in butter and served with rice, and the honey pepperoni snacks from Oyama Sausage Co. are a killer grab-and-go snack. Since Eats Abroad is geared toward travelers, are there any bars or restaurants at YVR or in the city’s hotels that you enjoy visiting? Yew Restaurant + Bar at the Four Seasons Hotel, UVA Wine & Cocktail Bar at the Moda Hotel, Boulevard Kitchen & Oyster Bar at the Sutton Place Hotel and the Lobby Lounge and Terrace at the Fairmont Pacific Rim. Vancouver is such an amazing place to discover new cuisine and beverages, but really, if the weather is nice, stay outside and walk the Seawall to Stanley Park or take a drive to Squamish and hike the Stawamus Chief. 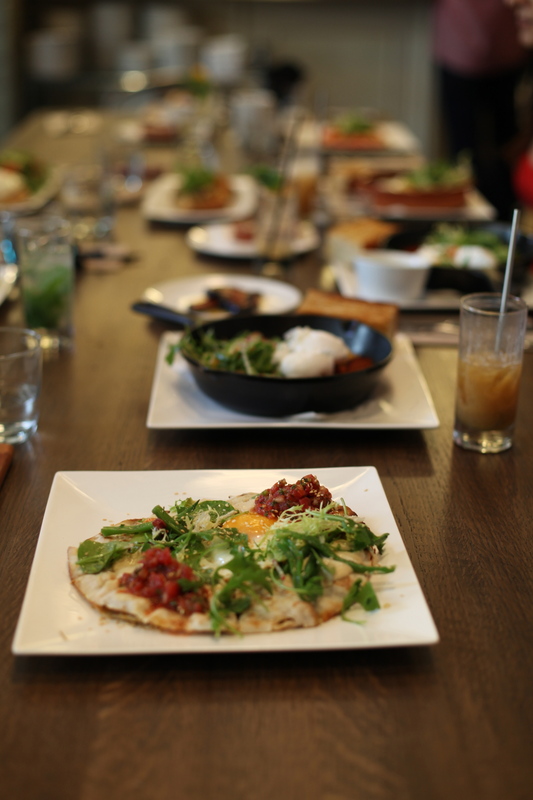 Start at Café Medina for brunch and then head out to enjoy our beautiful city! Café Medina, 780 Richards Street (Downtown); Mediterranean, breakfast and lunch Monday-Friday, brunch Saturday-Sunday. Boulevard Kitchen & Oyster Bar at Sutton Place Hotel, 845 Burrard Street (Downtown); seafood, breakfast, lunch and dinner daily. Damso Modern Korean Cuisine, 867 Denman Street (West End); Korean, lunch Friday-Sunday, dinner daily. Upstairs at Campagnolo, 1020 Main Street (Strathcona); bar food, dinner daily, brunch Saturday-Sunday. Ask for Luigi, 305 Alexander Street (Downtown Eastside); Italian, lunch Wednesday-Friday, dinner Wednesday-Sunday, brunch Saturday-Sunday, closed Monday-Tuesday. YEW seafood + bar at Four Seasons Hotel Vancouver, 791 West Georgia Street (Downtown); seafood, breakfast, lunch, and dinner daily. The Fish Counter, 3825 Main Street (Riley Park); seafood, lunch and dinner daily. Motomachi Shokudo, 740 Denman Street (West End); Japanese, lunch and dinner Thursday-Tuesday, closed Wednesday. Benton Brothers Fine Cheese at Granville Island Public Market, 1689 Johnston Street (Granville Island); charcuterie, open daily. Second location: 2104 West 41st Avenue (Kerrisdale); open Tuesday-Sunday, closed Monday. Zakkushi, 823 Denman Street (West End); Japanese, dinner daily. Second location: 4075 Main Street (Riley Park); lunch Wednesday-Sunday, dinner daily. The Liberty Distillery, 1494 Old Bridge Road (Granville Island); open daily. Fisherman’s Terrace, 4151 Hazelbridge Way, Richmond, B.C. ; Chinese, breakfast, lunch and dinner daily. The Red Wagon Café, 2296 East Hastings Street (Granview Woodlands); breakfast and lunch daily, dinner Wednesday-Sunday. Maenam, 1938 West 4th Avenue (Kitsilano); Thai, lunch Tuesday-Saturday, dinner daily. The Keefer Bar, 135 Keefer Street (Chinatown); open daily. UVA Wine & Cocktail Bar at Moda Hotel, 900 Seymour Street (Downtown); Italian, lunch and dinner daily. West Restaurant, 2881 Granville Street (Fairview); contemporary regional, lunch and dinner daily, brunch Saturday-Sunday. Alibi Room, 157 Alexander Street (Gastown); modern tavern food, dinner daily, brunch Saturday-Sunday. The Lobby Lounge and Terrace at Fairmont Pacific Rim, 1038 Canada Place (Coal Harbour); Pacific Northwest, lunch and dinner daily. Gringo, 27 Blood Alley Square (Gastown); Mexican, lunch Monday-Saturday, dinner daily. Fritz European Fry House, 718 Davie Street (Downtown); fries and poutine, open Tuesday-Sunday, closed Monday. About the Chef: It’s 9:10 on a Sunday morning and there’s a line about 15 deep out the door of Café Medina. The restaurant has been open for a mere 10 minutes, and the wait for a table is already at an hour. This is just a typical weekend morning here at one of Vancouver’s hottest brunch spots. Telling yourself you won’t get seated immediately is practically a given (unless you arrive well before the restaurant opens), but if the queues here tell you anything, it’s that the food is worth the wait. In August, Café Medina welcomed Jonathan Chovancek as its new executive chef. In addition to his 20 years of restaurant experience, Chovancek co-created a retail line of culinary and cocktail bitters called Bittered Sling Extracts with his life and business partner, Lauren Mote (of UVA Wine & Cocktail Bar). A lifelong native of British Columbia, Chef Chovancek creates dishes that feature the local, sustainably sourced ingredients that he’s so familiar with, while keeping to Café Medina’s beloved Mediterranean-inspired menu.